The overall aim of your blog is to help your audience with the issues they struggle with while also educating them on what they need to know to do business with you. That’s too much responsibility for just one article, so each blog post you publish can be thought of as a piece of your content marketing strategy puzzle. And how do you connect those puzzle pieces to keep readers engaged with your story and on your site for longer? Today’s post shares a simple, easy way to enhance the power of your blog posts. I often advise writers to be selective about the hyperlinks that they include in their blog posts. While links allow you to site external sources and provide more background information on certain topics, articles that make sense without clicking on a bunch of links are naturally easier to read. That said, linking to your own content is an opportunity to showcase your authority and demonstrate that your website is a helpful resource. You just need to make sure you add links in a strategic way that doesn’t disrupt a reader’s experience. The three steps below will help you find the right balance. When you choose a new topic to write about, get in the habit of reviewing the content you’ve recently published, as well as your cornerstone content and landing pages for your products or services. Start by picking three to five links, depending on the length of your blog post, and look for ways to weave in links to the other content you want to highlight. 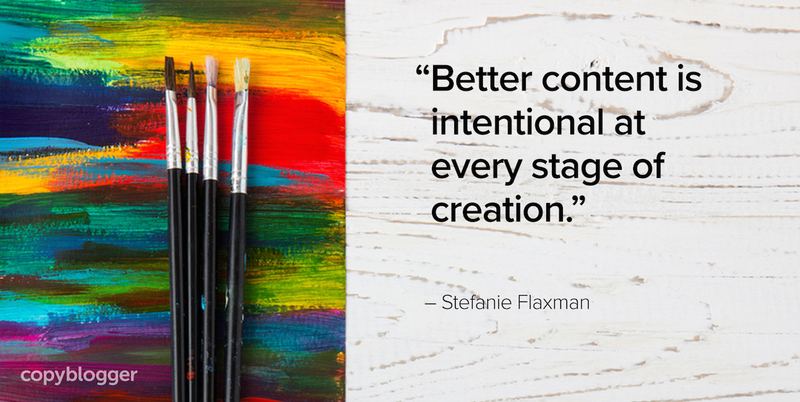 Better content is intentional at every stage of creation. For example, while writing about how to avoid a rookie marketing mistake for Copyblogger, I may mention the benefits of using a call to action. Instead of going on a tangent in that article to completely define a call to action, I’d hyperlink text that says “call to action” to a blog post on Copyblogger that explains how to use that useful copywriting standby. And what if I didn’t already have an article written about using calls to action? Step #3 will address that question and give a quick reminder about the flexibility of blogging. When you know who is in your audience, you know the type of information that interests them. As you look for the right content to link to, think about compelling words and phrases that match the experience your reader wants to get from your site. Again, it can be a soft sell, rather than a direct call to action to check out the article. Once you’ve drawn in a reader with your low-sugar grape jam recipe, you simply guide them to something else they might like to read about or the right product or service for their needs. Sometimes you’ll discover these link opportunities while editing your content, so you don’t need to be too strict about identifying them all right away when you write your draft. Copyblogger has been around for almost 12 years and we still use this step all the time — but new content marketers will find it especially handy. Let’s say we didn’t already have a post about calls to action on Copyblogger. If I mentioned that term in a new post I’m writing, I would briefly explain the concept in the post and then make a note in my editorial calendar to write a more in-depth post on the topic soon. Remember that everything doesn’t have to be “perfect” before you publish. Make your content as complete as it can be and you can always optimize it later. Links are an integral part of the internet, and you can create your own web of content that your audience enjoys visiting and exploring. Have any favorite ways to use links to guide your readers to more helpful information on your website? When you’re a writer, you know it, and it sounds like you know it, Sophia! I’m a natural born storyteller, and for some crazy reason I started to separate that from my content and writing became a chore. No fun! Hold on to that joyfulness! I’m a content writing coach, and I know that telling stories in content will bring you and your audience joy and make marketing effortless and fun! Thanks for your reply! I hope I will be improving myself all the time. I especially love the visual you create with the heading, “spin your own content web”. I strive to include a link to my previous article, but I think you’ve illustrated a way to interlink content in a smarter way. Linking to both recent articles, cornerstone content, and landing pages ensures we create a stickier content web for our readers. Sometimes we get so caught up in driving blog traffic by creating new content we forget all the evergreen content out there, on our blogs, already. Content readers can easily access if we share it through links in, via the awesome idea of internal linking. Talk about leveraging. Talk about enhancing the power of your blog posts. Timely post too, Stefanie; I linked in quite a bit via my latest blog post, while also linking out to a few top bloggers. Good way to drive traffic to old posts and to send folks to trusted resources….and of course, linking out to top blogs is a smart, easy way to build bonds with top shelf bloggers. Win-win-win, for you, your readers and for fellow bloggers. Thanks for sharing the rocking content, as always. And midway through reading this post, I stopped and added another link to my latest post! I was on the fence about it but you convinced me that I was right all along. Why does it have to be a lot of work? Stories have a way of spinning their own web without a ton of effort or planning in my experience as a writer and content marketing coach. For me, and a lot of people I know, storytelling takes care of step 1 and 2, and the links to previous or future stories don’t need to be planned out because they happen naturally. Stories always connect with other stories, past, present, and even future. You know how you’ll chat with a friend about one subject and get caught up in a haze of thrilling conversation? Next thing you know, it’s been four hours and you’re on a completely different subject. You can’t believe that much time has passed because you enjoyed sharing stories and talking! Think of the connections made between the different stories and subjects in that four hours (like links in a blog post) plus the connection with the person you spoke with for four hours is stronger too. That’s why storytelling in content marketing is soooo powerful and that’s why I am so passionate about helping people unleash their Inner Storytellers in content marketing! It makes marketing fun and a lot easier! True word mastery. A blog article that practices whilst it preaches. Thank you for a great post. I then went to Cornerstone Content links and you helped me visualize what my website needs to look like vs. where it is now. My business blog is now 5 years old Stefanie and over the years I’ve created a lot of posts and learned a lot along the way. My newer posts link back to relevant old posts and now I’m going through the older posts to check if the images are relevant and SEO optimized and yes, linking to newer posts that are relevant. Thank you for your tips. This is a really important point, actually. I found this blog through an article initially posted in 2012, which took me to a sept ’17 post. Your blog post reminded of bloggers who create amazing content, but I find their content a little congested with link-bombardment. I get it; they’re enthusiastic about the long-tail keywords. I always felt that it would have been better if a hyperlink won’t consist of 6 to 7 words. Instead, two or three words could have been fine. Copyblogger understands this way better than everyone. Secondly, I have seen bloggers who won’t link to other blogs. On the contrary, I learned from top blogs that we should link out to the top resources on the web as long as it helps the readers. Thank you so much for this blog post. Great piece of content. Most of the new bloggers have only one thing in mind – that is to get money out of blogging. But they only have little knowledge about SEO. Most especially on-page SEO. Internal linking plays a big role and reduce the bounce rate if your content is interesting and has high quality information. Thanks for reminding a lot of bloggers. Great post! It reminded me of when I was finishing up my website, and it suddenly dawned on me: “You know, you can link people to your online course AND your course FAQs right here on your own site!” Sort of a prophet-in-their-own-land kind of thing. We often look farther out, but forget about looking at home :-> Thanks so much for the reminder to use links wisely for OUR benefit. As a starting blogger, I am on a spree to find blog articles which can teach me more and more on how to achieve the greatest results in the shortest time possible. This is one blog post that has guided me a lot on linking. Someone told me that links are the major currency on the internet. Thanks for the blog post. A lot of useful information in here. Very helpful tips, Stefanie. I totally agree with pre-planning the internal links. We really have to be intentional with what we write so that it works together seamlessly. And yes to #3, one piece of content can spin off into another one or even several. it’s very helpful to have a place where you can just dump all these raw ideas. I have an Evernote full of stuff — really handy when I’m stuck. Will share this in my socials.